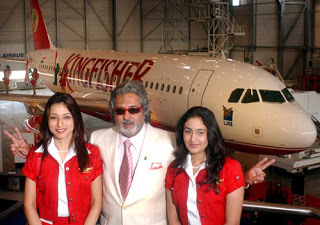 The employees of the grounded Kingfisher Airlines, who were on a hunger strike, called it off this evening though airline chairman Vijay Mallya reportedly expressed inability to pay salary arrears. The agitation was called off after the second round of meeting between the employees and airline CEO Sanjay Agarwal, sources said. Earlier in the day, Mallya reportedly told the agitating employees, who were on a hunger strike since yesterday, that he did not have money to pay them. "I don't have the money to pay your salary dues, because I cannot use the proceeds from the United Spirits-Diageo deal for this because of injunction from the Karnataka High Court," Mallya reportedly told the striking employees. CEO Agarwal refused to talk to the reporters this evening at the Kingfisher House here. But employees called off the agitation as management agreed to continue to have dialogue with them, sources said. Salaries have not been paid since last August. Last November, Mallya clinched a deal with British liquor major Diageo to sell majority 53.4 per cent stake in United Spirits for Rs 11,166 crore. The deal also involves Mallya selling 19.3 per cent of his personal/promoter holding in United Spirits to Diageo for Rs 5,742 crore. Kingfisher Airlines, which never made profit since inception in May 2005, has remained grounded from October last and the regulator DGCA also cancelled its flying licence in December. Kingfisher is notable for its lowest domestic fares among all different airlines and it covers several cities and tiny cities with Chennai. Spice Jet Airlines, also popular for low airfares, has flights to Maa, running on a daily creating the traffic additional versatile and comfy. Don't know what is wrong with airlines these days. Some are crashing, some are harassing. They really need to sort themselves out. Usually it happens employees have to suffer more than the owner when business is on loss or they have loans to pay. The first thing businessmen do is to stop laor;s salary. Its not good.